“Tell the truth and you’ll have less to remember” is a nugget of wisdom passed down to many at an early age. Unfortunately, most of us have to learn about the pitfalls of dishonesty the hard way when even the most carefully constructed web of lies inevitably collapses on itself. Michelle Oullett puts an entire town on trial through this framework, both literally and figuratively, in Prodigals. Wesley (David Alpay) has returned home to Sault Ste. Marie, Ontario (aka “The Soo”) at the behest of Nina (Kaniehtiio Horn) to assist in the defence of her hothead brother Benny (David Kaye) who is on trial for murder after a bar fight gone wrong. His friends are all happy to see him after a five year absence with the notable exception of Jen (Sara Canning) who still hasn’t forgiven him for abandoning her for the bright lights of Toronto. Little do any of them realize that Wesley is in fact a law school dropout and not a real lawyer at all. In fact, his true intentions are to make things right with Jen and whisk her back to Toronto, whatever the outcome of Benny’s case may be. Things begin to look up as Wesley’s efforts at the trial begin to turn things in Benny’s favour. Jen is also slowly warming to her ex’s attempts to make amends despite the fact that she’s still dating their mutual friend “Nips” (Nicholas Carella). But when cracks begin to show in Wesley’s facade and old unresolved issues begin to rear their ugly head, he must decide whether to run away yet again, or make the ultimate sacrifice to put things right. Prodigalsbegan it’s life as a stage play and it shows with its surefire crackling dialogue and bang-on performances by a standout cast. There is a lot of baggage to unpack onscreen, but under Oullett’s assured direction, the film pulls no punches. Guided by the pen of original playwright Sean Minogue and co-screenwriter Nicholas Carella, every character puts on a show to some degree while keeping their issues, hurt, and insecurities hidden. This of course blows up in their faces eventually and it’s amazing that adults continue to shirk lessons they should have learned as children. Do any of us really ever grow up? It’s a huge credit to David Alpay that he can take what could have easily been a very unlikeable character and mould him into a complex individual who effortlessly portrays charisma when hanging with the guys or killing it in the courtroom, but also carries a burden of regret, shame and paranoia that threatens to burst out at any moment. The remaining players all bring their A-game to the table. 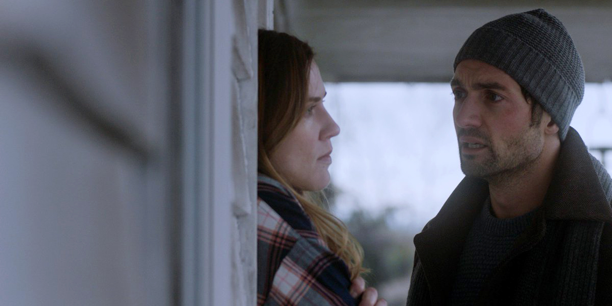 Sara Canning shines as the scorned Jen who tries to establish roots in the Soo, despite dreams of travel. Brian Markinson is as sharp as ever in the role of thankless public defender who may have bit off more than her bargained for by accepting Wes’ help. Producer David Kaye impresses as Benny who is more nuanced than his thuggish exterior allows and Jameson Parker brings much-needed levity to his scenes as Wes’ slacker best friend Greg. The first-rate cinematography of Lindsay George also deserves special mention. The bleakly stark surroundings of the Soo are expertly photographed and the subtle camera moves as well as framing help set the film apart from many contemporary efforts that often devolve into a series of hand-held close ups. It’s not an easy task to take your characters and story through a meat grinder and leave your audience wishing they could still continue the journey with them. The filmmakers have crafted a superb piece of cinema with several of them pulling double duty both in front and behind the camera. This is the type of Canadian film that deserves to be screened outside our borders as well as within. I look forward to their future projects. Prodigals screens Tuesday, July 24, 6:30pm at Vancity Theatre in Vancouver.